Enjoy this itinerary and family friendly day without the hassle of running to and from the parking meter. Use the parking app "Pay By Phone" to manage everything directly from your phone. Spend more time with your kids on the playground, enjoying art and ice-cream and spend less worrying about parking meters. Looking for fun things to do for kids in San Francisco that foodie parents will enjoy as well? This itinerary is for you! 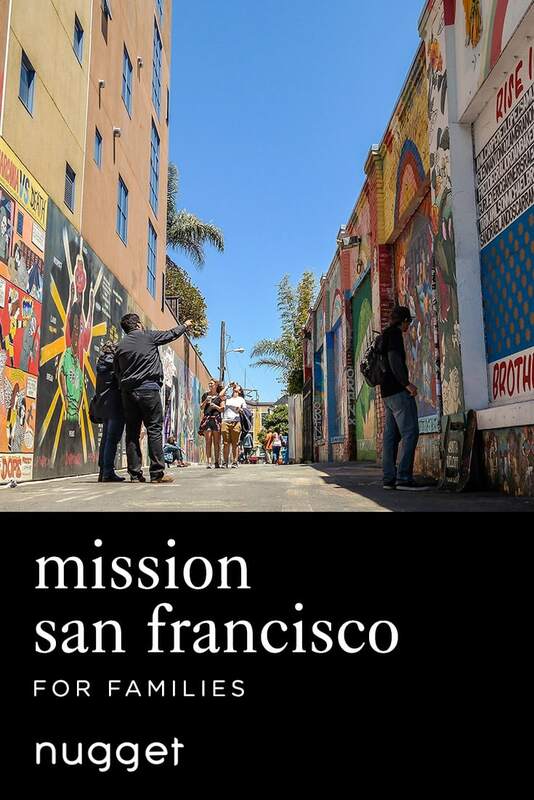 Explore San Francisco's vibrant Mission District in a fun-filled, family-friendly afternoon that offers something for parents and kids alike. Pick up delicious treats at Tartine Bakery before heading to Mission Dolores Park. Enjoy beautiful views of San Francisco’s iconic skyline while your nuggets burn off some energy on the park’s large playground. Afterwards, treat your family to delicious ice cream at Bi-Rite Creamery before visiting the large-scale murals at Clarion Alley. Exhibits are always changing and your children will love spotting art in the neighboring streets. If you have time, take a walk along Mission Street, where you’ll find shops, restaurants and markets selling everything from luggage and fidget spinners to t-shirts and fruit. Keep your eyes open, you never know what you might discover. When you’re ready for dinner, drive over to Hayes Valley, where Straw serves up an incredible burger made of two glazed doughnuts! Tartine Bakery & Cafe is known for its mouth-watering breads and pastries. Located on the corner of Guerro and 18th Street, Tartine doesn’t have a sign, so look out for a long line out the door – once you see it, you’ll know you’ve arrived. Don’t let the line discourage you, the desserts are well worth the wait! DIRECTIONS There is plenty of on-street parking on 18th Street, near the bakery. TIP There is plenty of on-street parking on 18th Street, near the bakery. Dolores Park is one of the most popular parks in San Francisco and offers sweeping views of the city. There is a fabulous playground, as well as plenty of grassy areas for free play. Dog lovers will also enjoy the large off-leash area. DIRECTIONS From Tartine walk one block up 18th street and the park will be on your left. After all that park play, an ice cream seemed like a great idea! A San Francisco institution, the Bi-Rite Creamery is a popular place. Again, there might be a line, but it moves quickly and the delicious seasonal flavors are worth the wait! DIRECTIONS Bi-Rite Creamery is located on 18th Street, about half a block from Mission Dolores Park, on the opposite side of the street from Tartine. The Mission District is famous for its wall murals, some of which were painted in the 1970s and reflect the neighborhood’s Latino culture and traditions. More recently, other types of street art have entered the mix. There are hundreds of murals throughout the neighborhood. Clarion Alley, off of 18th Street, between Mission and Valenica Street, is the home of the Clarion Alley Mural Project, which was started in 1992 by Mission residents. The murals here are predominantly political in nature. Beyond Clarion Alley, the Mission District has many other wonderful pieces of street art just about everywhere you look. DIRECTIONS Clarion Alley is located off of Valencia Street, between 17th and 18th Street, just around the corner from both Tartine and Bi-Rite Creamery. TIP Interested in seeing more? Some fun child-friendly pieces featuring superheroes and honey bears can be found on 19th and Mission Street as well as 19th and San Carlos Street. But be aware, the art always changes, so we can’t guarantee these will still be there. Straw is a carnival-themed restaurant with unique comfort foods and decor. They are famous for their donut burger called the Ringmaster. It's a hamburger sandwiched between two glazed donuts. Weird but good! DIRECTIONS Straw is located on Octavia Street in the Hayes Valley neighborhood, a short drive from Mission.